Bring your love of butterflies to the forefront of your entryway or garden using the Ancient Graffiti Raised Butterflies Disc Wall Art. Placing this metal disc on your wall will certainly offer both style and dimension to any setting, thanks to its flamed copper colored finish and raised detailing. The 12.25" diameter of the disc perfectly occupies just the right amount of wall space, and an attached hanger on the back makes placing it simple. Raised metal rods arch along one side of the disc, accommodating a wealth of metal butterfly shapes. The differing brown and copper tones of these figures contrast the background, enhanced even more by a slightly iridescent finish. The metal construction remains durable for many seasons, and the adornment looks lovely inside or outdoors. 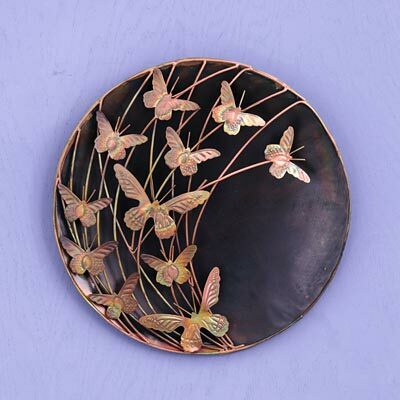 Add a classic scheme to any wall with this Raised Butterflies Disc Wall Art.